During presentations, I’m often asked questions about how big a company needs to be to become a Social Business. Typically, people can see the value of being able to recognize talent and expertise within a large company with offices all around the world, but what about when all your staff are in one office? Social Business is all about connecting with people. Even though you may work for a large global company, it all comes down to the number of quality connections you’re able to make. You’re really only as good as the level of intimacy with the connections you have. This morning, I was walking along Queen Street in Auckland, New Zealand. It was obvious that an artist had been in the area over the past few hours. 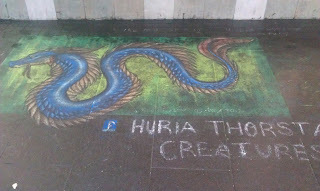 On the footpath was a piece of artwork done in chalk. There were a couple of things which caught my eye, firstly the obvious skill of the artist and secondly a Facebook logo. Too me the message was clear, “If you like my work, then here’s how to connect with me.” Sure enough, I did just that. I managed to find the artist on Facebook. From there the interaction was more meaningful. I didn’t find a sales pitch, but I found a real person who was willing to share a part of their life with me. I may not agree with various personal preferences, but that’s beside the point. I made a connection. One of the fundamental keys to success as a Social Business is about enabling people to connect with subject matter experts (SME’s). It’s about people connecting with people both within the organization and also outside; customers. Not only that, but it’s about having the ability to connect in a meaningful way with the right people. What modern technology (call it social media if you like) provides is a way of enabling connection points with people. It’s about being able to provide access to your people for the purpose of doing business. If you were to build a retail store that took up an entire block in the central business district of a major city, it is unlikely that you would just have one door on one side of the street. Rather, you’d most likely provide a number of entry points around the perimeter of the building. Likewise, a Social Business provides multiple entry points into the organization so that connections can be made. Technology is a great enabler for the Social Business. With the use of mobile devices and the ability to be online from most populated places, your customers, employees and business partners are going to want to connect with you for more meaningful interaction.